The new packaging was designed to echo the brand’s handcrafted nature and the fresh, Adelaide Hills juice. We wanted to reflect both the region’s renowned oak trees and the traditional apple crates used for handpicking, so we have used a fine oak grain on our labels and a wooden crate as the new 6 bottle carry pack. The result is a complex and well balanced palate with noticeable fresh, Red Delicious apple notes, giving way to a crisp, clean finish driven by the natural acidity in the apple juice. The combination of varieties provides a balance of sweetness, acidity and tannins, ensuring a rounded palate and wonderfully refreshing finish. The new packaging will also roll out across the brands Crisp Pear Cider, to be released in February 2016 using pears sourced from Goulburn Valley, Victoria. 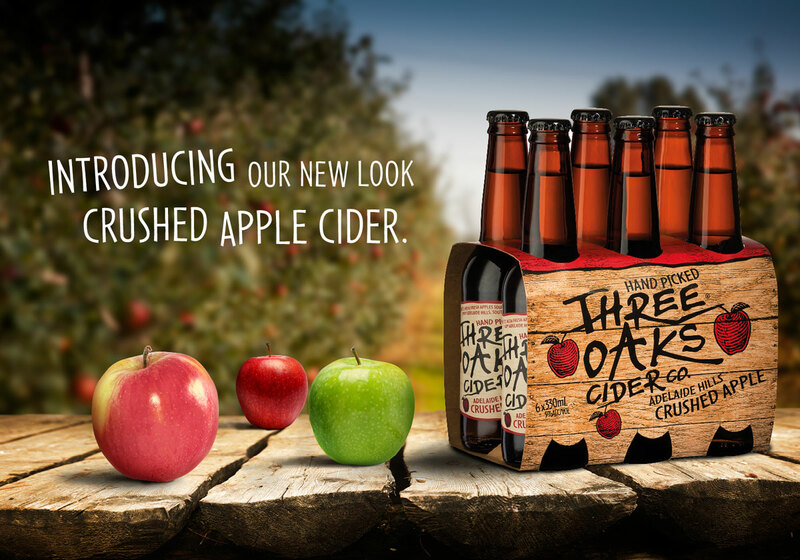 Three Oaks Cider is available at all good liquor retailers in both 330ml bottle (6 pack) and 375ml can (10 pack) formats. ENGAGE WITH THREE OAKS CIDER CO.